22 September 2014, at 11:53p.m. 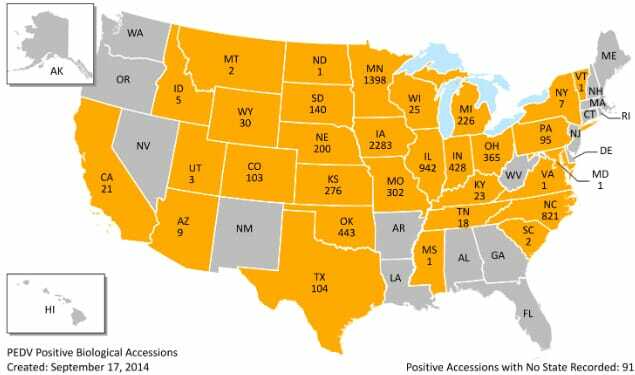 US - The total number of pig farm samples that have tested positive for the Porcine Epidemic Diarrhoea (PED) virus now stands at 8,386 in 31 states, writes Jackie Linden. There were 68 new positive samples in the most recent week reported. The National Animal Health Laboratory Network (NAHLN) reports reports 68 positive accessions out of 759 tested at nine veterinary diagnostic labs for the week ending 13 September, according to the American Association of Swine Veterinarians (AASV). 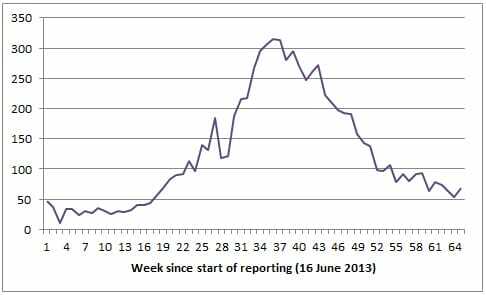 The total number of pig farm samples (termed 'laboratory biological accessions' in the official report) that have tested positive for the PED virus (PEDv) since April 2013 now stands at 8,386, which includes 68 for the most recent week. For the curent month to date, 1,450 accessions were tested, of which 122 samples or 8.4 per cent tested positive for PEDv. Since testing was fully reported in November 2013, 32,211 farm samples have been tested, of which 23 per cent have tested positive for the virus. For the current month to date, 187 farms have been tested, of which 19 samples or 10 per cent were positive for PEDv. For the month of August, 381 accessions were tested, of which 69 samples or 18 per cent tested positive for PEDv. Since testing was fully reported in November 2013, 4,460 farm samples have been tested, of which 1,834 samples or 36 per cent tested positive for PEDv. For the current month to date, 182 farms have been tested, of which 18 samples or 9.9 per cent were positive for PEDv. For the month of August, 415 accessions were tested, of which 55 samples or 13 per cent tested positive for PEDv. Since testing was fully reported in November 2013, 4,771 farm samples have been tested, of which 1,491 samples or 28 per cent tested positive for PEDv. For the current month to date, 231 farms have been tested, of which 17 samples or 7.4 per cent were positive for PEDv. 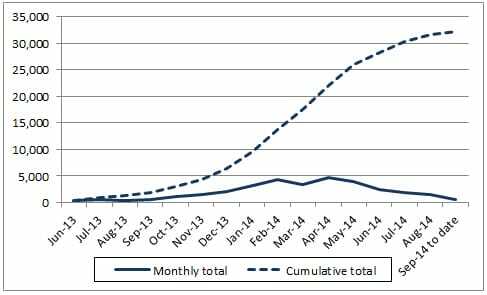 For the month of August, 546 accessions were tested, of which 35 samples or 6.4 per cent tested positive for PEDv. Since testing was fully reported in November 2013, 5,491 farm samples have been tested, of which 1,443 samples or 21 per cent tested positive for PEDv. For the current month to date, 145 farms have been tested, of which two have tested positive for PEDv. For the month of August, 213 accessions were tested, of which nine samples or 4.2 per cent tested positive for PEDv. Since testing was fully reported in November 2013, 2,697 farm samples have been tested, of which 660 samples or 18 per cent tested positive for PEDv. For the current month to date, 756 farms have been tested, of which 68 samples or 9.0 per cent tested positive for PEDv. 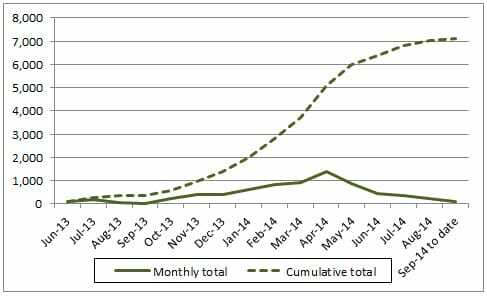 For the month of August, 1,753 accessions were tested, of which 152 samples or 8.7 per cent tested positive for PEDv. Since testing was fully reported in November 2013, 15,956 farm samples have been tested, of which 3,169 samples or 19 per cent tested positive for PEDv. According to AASV, the total number of states with one or more positive results, according to the official report, now stands at 31. The total number of positive accessions on this report (up to the week of 7 September) is 8,386, 68 more than the previous week. Those states with 200 or more positive tests are: Iowa, 2,283; Minnesota, 1,398; Illinois, 942; North Carolina, 821; Oklahoma, 443; Indiana, 428; Ohio, 365; Missouri, 302; Kansas, 276, Michigan, 226 and Nebraska, 200. For the most recent week (week of 7 September), the state reporting the most new positive tests was Minnesota with 16, followed by Iowa with 12 and Illinois with 10. Also reporting one or more positive results were Arizona, California, Indiana, Kansas, Michigan, Missouri, North Carolina, Nebraska, Ohio, Oklahoma, Texas, Utah, Wisconsin and Wyoming. 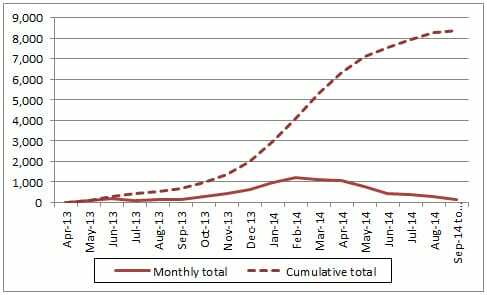 The total number of swine samples (termed 'biological samples' in the official report) since testing began in June 2013 now stands at 32,138. For the current month to date, 9,340 samples have been tested, of which 504 samples or 5.4 per cent tested positive for PEDv. For the month of August, 20,808 accessions were tested, of which 1,401 samples or 6.7 per cent tested positive for PEDv. Since testing was fully reported in November 2013, 186,447 samples have been tested, of which 16 per cent tested positive for PEDv. The total number of environmental samples testing positive since testing began in June 2013 now stands at 7,120. For the current month to date, 1,075 samples have been tested, of which 92 samples or 8.6 per cent tested positive for PEDv. For the month of August, 2,627 samples were tested, of which 236 samples or 9.0 per cent tested positive for PEDv. Since testing was fully reported in November 2013, 33,974 samples have been tested, of which 19 per cent tested positive. You can find out more news on about PED by clicking here.